100-110 Commonwealth (240 Clarendon) is located on the SW corner of Commonwealth and Clarendon, with 90 Commonwealth to the east, 114 Commonwealth to the west, the Clarendon Street Playground to the north, across Commonwealth, and 234-236 Clarendon to the south, across Alley 435. 100-110 Commonwealth (240 Clarendon) was designed by Henry Hobson Richardson and built ca. 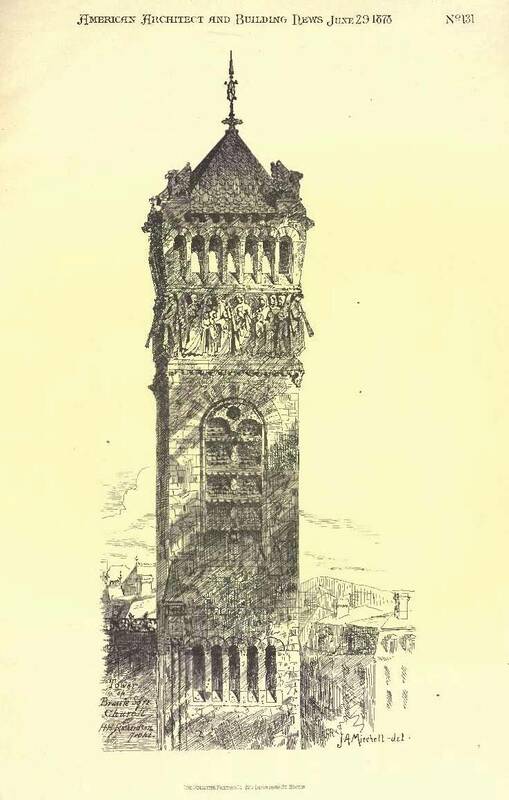 1873 for the Brattle Square Church. 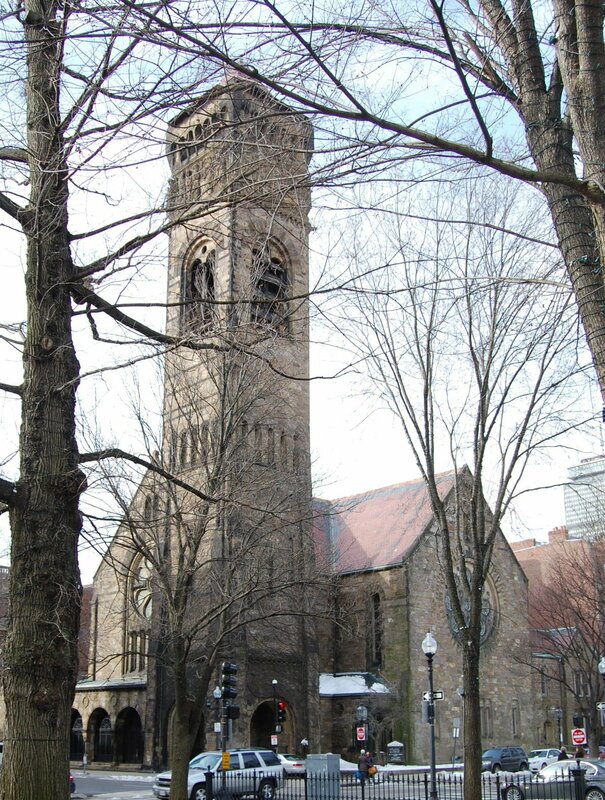 The original Brattle Square Congregational (later Unitarian) Church was built in 1699 on land donated by Thomas Brattle (the land was located on Brattle Street, replaced in the 1960s by Boston’s Government Center). In the 1770s, the original church was replaced by a new church in the same location. 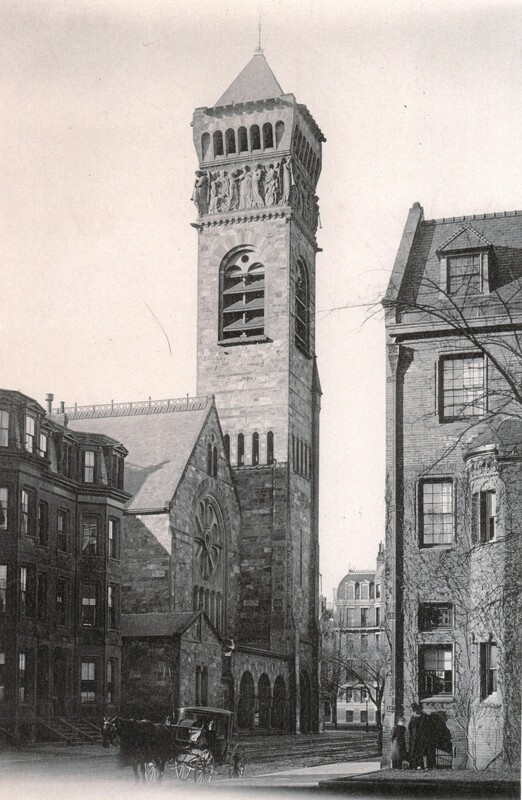 By the late 1860s many of its members had moved to the Back Bay and the Proprietors decided to relocate their church to the new neighborhood. A design competition was held and, in July of 1870, Henry Hobson Richardson received the commission to design the new church. The original church was built on a lot with a 116 foot frontage on Commonwealth. 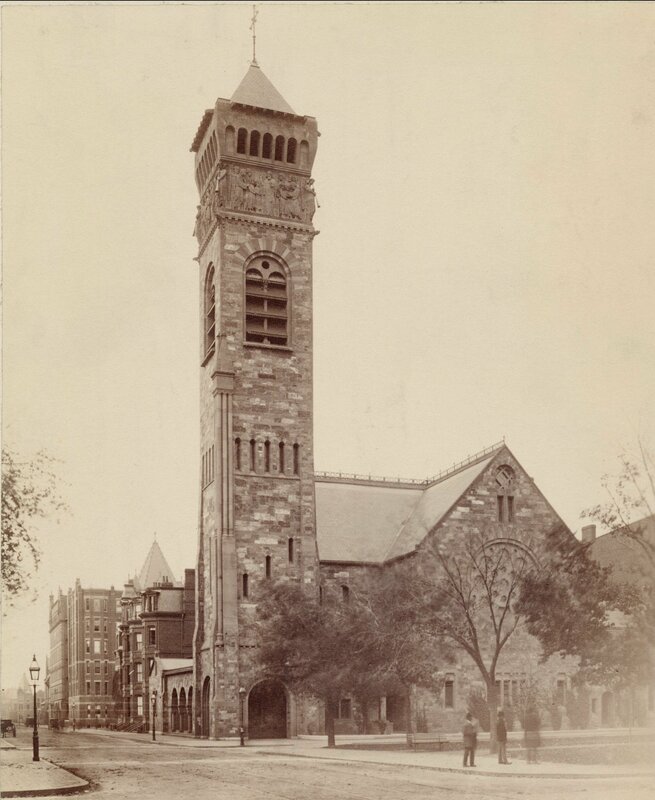 The land was purchased from the Commonwealth of Massachusetts on October 1, 1866, by Franklin Haven, Ebenezer Dale, and John Gardner, and acquired from them by the Proprietors of the Church in Brattle Square on June 29, 1872. Click here for an index to the deeds for 110 Commonwealth (240 Clarendon). 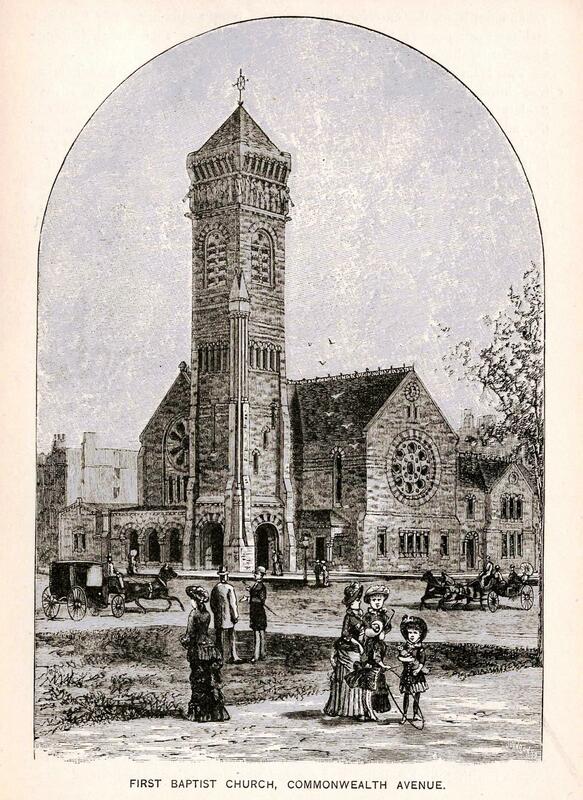 Not long after the church was dedicated, the congregation was encountering increasing financial pressures, including the burden of the mortgage undertaken to finance the construction and the more general economic downtown following the financial Panic of 1873. In October of 1875, the church ceased public services. 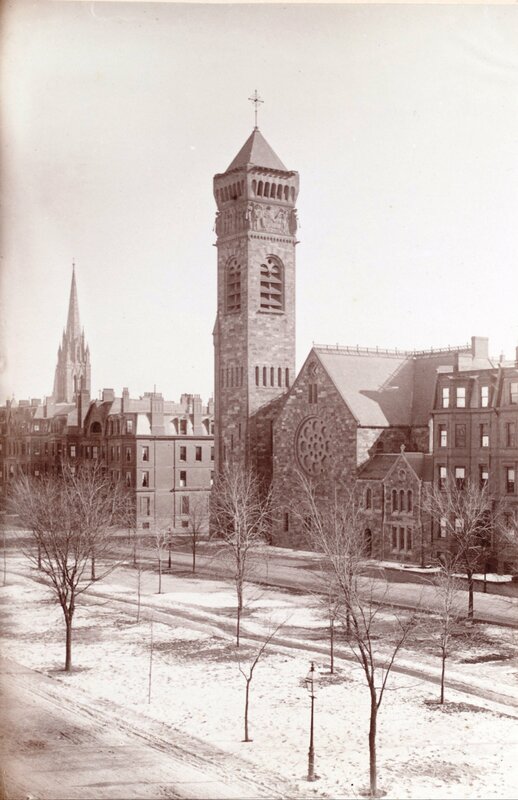 At the annual meeting of the proprietors in March of 1876, it was agreed to explore sale of the church, and at their annual meeting in March of 1877, the proprietors voted (as reported by the Boston Globe on March 21, 1877) “to sell the meeting-house of this corporation … and also the organ, bell, carpeting and all the personal property, and that from the proceeds of the sale” the society would “pay off the mortgages and all other liens and encumbrances” on the property. No buyer emerged and the proprietors renewed their decision to sell the property at their annual meetings in March of 1878 and March of 1881. The property was offered for sale at public auction on May 1, 1881. It was purchased at the auction by Joshua Montgomery Sears on behalf of residents seeking to protect the church from destruction. The deed conveying the church to him was dated May 28, 1881. He and his wife, Sarah Carlisle (Choate) Sears, lived at 12 Arlington. J. Montgomery Sears sold the church to the Deacons of the First Baptist Church in Boston on March 29, 1882. 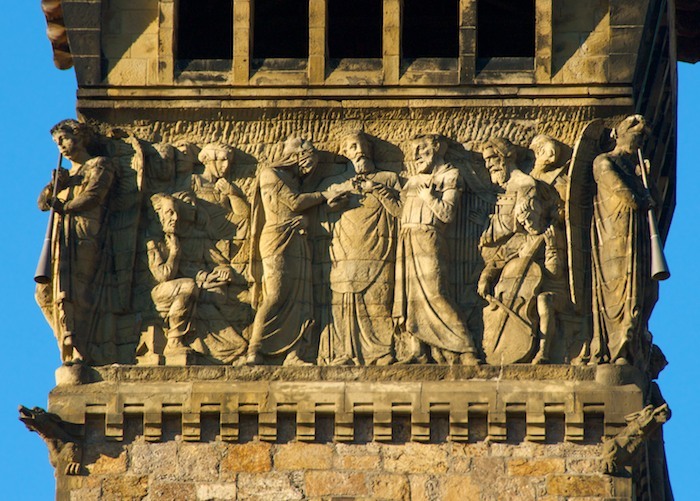 The Boston Memorial Association was formed in 1880 to provide a vehicle by which donations and legacies for the improvement and beautification of the city could be left in trust. It merged with the Bostonian Society in 1902. On July 10, 1882, the First Baptist Church purchased the vacant lot west of the church from William Gordon Weld (who had purchased it on the same day from the Commonwealth of Massachusetts) for the purpose of constructing a chapel. 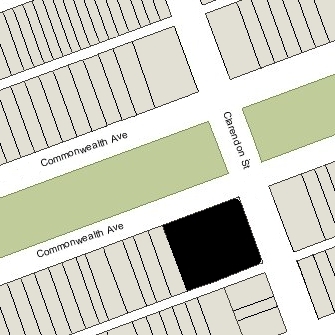 On July 18, 1882, the Church purchased a six inch wide strip of land to the west of the lot from David H. Coolidge, owner of 114 Commonwealth (the eastern party wall of 114 Commonwealth was built entirely within the boundaries of its lot, rather than located so that the boundary line ran down the middle of the wall with six inches on the lot for 114 Commonwealth and six inches on the lot to the east, as usually was the case; the First Baptist Church acquired the eastern six inches so that it would own its half of the wall). The chapel’s cornerstone was laid on September 12, 1882, and the building was completed in February of 1883. It was designed by architect Thomas William Silloway and built by Mead, Mason & Co. The First Baptist Church continued to be located at 100-110 Commonwealth in 2017.